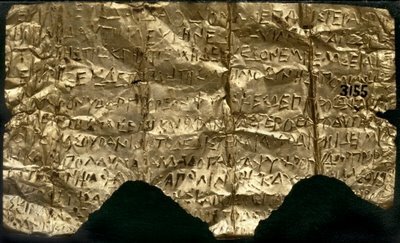 Early Christian Books on Lead Plates? 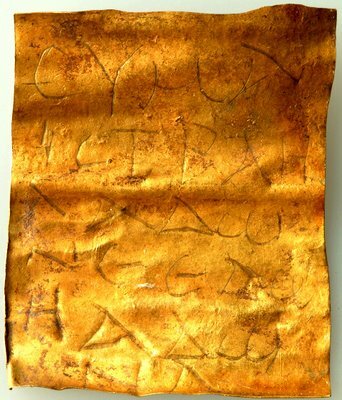 I haven't looked around to see if this has been discussed (it probably has), but some individuals in Israel have released some information about an ancient horde of tiny codices made of lead plates bound together (said to be about the size of credit cards), and in some cases sealed on all four sides. They may be from the first century CE, and they appear to have paleo-Hebrew writing on them mixed in with some coded script and possibly messianic symbols. The codices are largely being hidden away for now because they may be the rightful property of the Jordanian government and the owners want to make sure they're adequately researched before letting them go. Some photos have been made available, and the BBC just put some high quality pictures on their website that I share below. 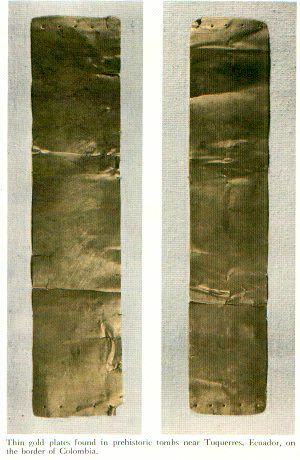 While it's obvious that Mormons are going to be interested in a story about ancient books written on metal plates, this thread isn't to suggest any kind of apologetic value for these codices. I just think it's a fascinating story and may turn into an incredibly valuable discovery. Out of curiosity, what sort of writings are on those plates? I haven't looked around to see if this has been discussed (it probably has), but some individuals in Israel have released some information about an ancient horde of tiny codices made of lead plates bound together (said to be about the size of credit cards), and in some cases sealed on all four sides. Beautiful pics, Makelan. Thanks for posting these. and in some cases sealed on all four sides. If they are genuine, then it seems to me that they are probably examples of Jewish theurgic texts. I agree with Volgadon. The script is Paleo-Hebrew, the text may be in code, the iconography seems to be Jewish (and temple oriented--menorah, palm trees, luvav, stars), and the star and dot decoration is found in theurgic texts. 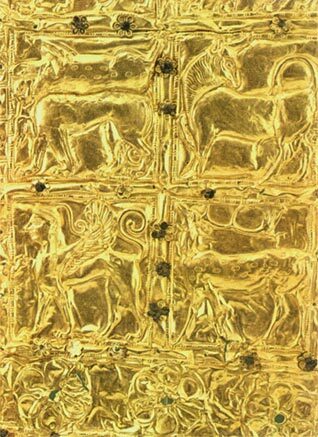 Lead plates were widely used in theurgy, and the sealing of the plates might be linked theurgic binding rituals. I've seen nothing that points to them being Christian texts. I would say 4-5th century CE. All of this, however, is purely a guess. Davies said he saw what looked like a map of Jerusalem with a tomb marked with a cross, but I haven't seen a photograph of that. 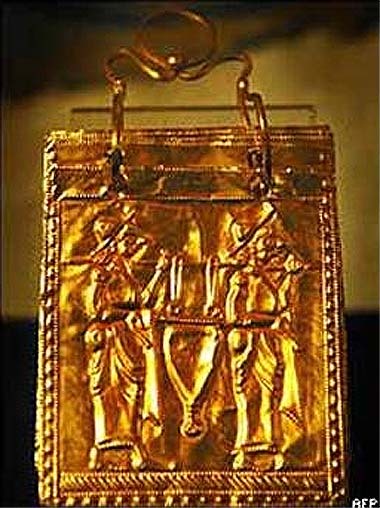 Larry Hurtado has argued that their size indicates personal use, and that personal codices like these first start popping up in the third century CE. Another picture available below shows a nine-branched menorah, which is peculiar for this time period or any earlier (oddly, you can see the branch on the far left does not connect to the stem). I would say 4-5th century CE. All of this, however, is purely a guess. If rumours of Bar Yohai's name appearing on the texts are correct, then I would guess closer to the end of the Byzantine era in Palestine and the beginning of the Muslim one. what I find interesting is that the plates appear to be "pressed". 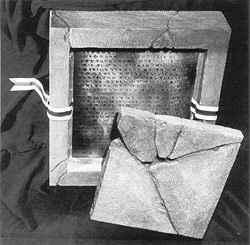 That is the texts that can be seen in the pictures appears to be raised text rather than an inscription. This matter is also being discussed on this board at link. I've just been reading what some on-line critics are saying about my ridiculously overeager, gushing reaction to this discovery ("It proves the Book of Mormon!" and so forth). It seems that I'll seize on just about anything as evidence for my absurd beliefs. What a maroon! What is most fascinating about my comments, though, is that I haven't actually made any on the subject. 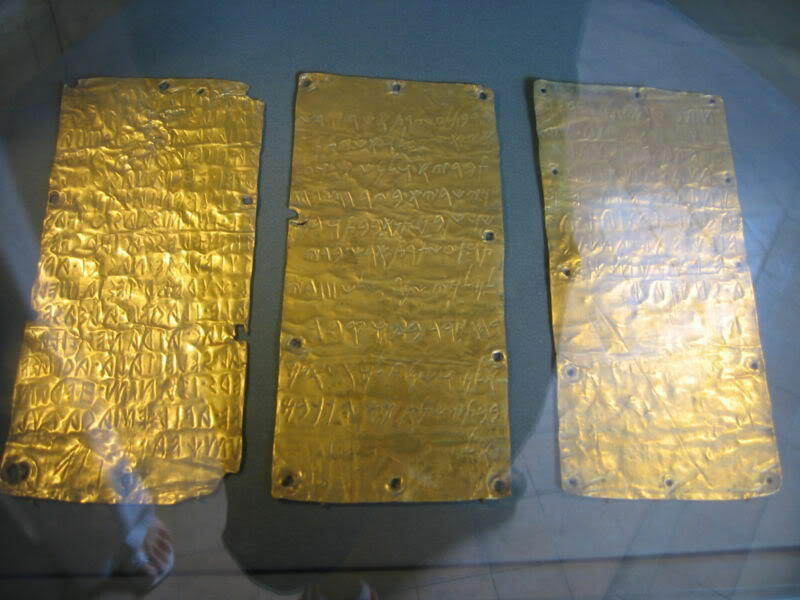 If the plates are authentically first-century, they may well have some apologetic value -- as, for instance, yet another illustration of the writing of ancient texts on metal plates, an example of ancient inscribed plates bound together by wires/rings, and a specimen of sealed plates. Also, perhaps, as an early witness to the resurrection of Christ, etc. They'll certainly have general historical value. I look forward to learning more about them, but remain cautious about them for the time being. Here's another link with more photos. The iconography, binding, etc. of new photos still impress me as theurgical texts. Philip Davies, emeritus professor of Old Testament Studies at Sheffield University, told Pigott he was "dumbstruck" at the sight of plates representing a picture map of ancient Jerusalem. "There is a cross in the foreground, and behind it is what has to be the tomb [of Jesus], a small building with an opening, and behind that the walls of the city," Davies explained. "There are walls depicted on other pages of these books, too, and they almost certainly refer to Jerusalem." Has anyone seen any photo of a plate that looks remotely like what Davies is talking about? 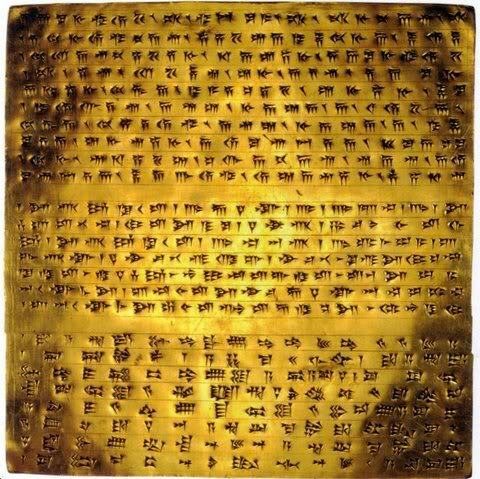 Finally, we can put to rest that anti-mormon myth that ancient people wrote on metal plates. If only these had come out in JS day he would not have been met with so much critisim about people writing on metal plates. On another note, these are an interesting find. Actually... in Joseph Smith's day, the criticism wasn't all that common. That's probably because many elementary school books, encyclopedias, dictionaries, biblical commentaries, religious periodicals, etc. actually promoted the notion that the ancients inscribed metal records. I'm going to put out a totally premature theory with no basis except my own speculation. In my studies on the endowment, I have memorized most of it, and I have worked out my own symbolic notation to explore how different portions relate to other portions. Incidentally, I think it is clear that there is a "vertical" structure in meaning as well as the obvious meaning in the linear text of the endowment, but of course I will never be able to prove that to anyone else without violating my covenants. But anyway, anyone finding my "notes" would look at them and have no idea what they meant- but in fact there are some similarities to these plates. I think it will turn out that these are likely to be symbolic mnemonic devices which record- who knows what? Something hidden I am sure. He thinks they are Jewish amulets. The script, if I understood him correctly, is ancient Hebrew, but is being copied probably at a later date. The media attention (including my own) comes from someone who appears to be promoting a book (which is not a sin). Just received a note, indirectly, from Peter Thonemann at Oxford. He presents a pretty good case that the documents are modern forgeries. I have made jewelery items by taking a flat piece of copper, and taking some lead wire (solder) and then heating the copper, the design partially melts and fuses into the copper. Lead wire on lead plates would probably work even better, and you would only have to get the temperature of the lead plate up to 800 degrees or so. So it is not necessary to think that they were stamped. This might also indicate that these are unique and not a "publication". 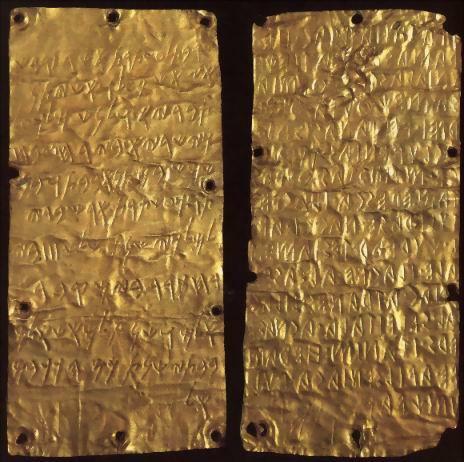 But these aren't the only plates that have been discovered that the ancients wrote on. The anti's know about the others... they just don't care. It doesn't change their mold.